Southeast Regional Office Program Specialist Tracy Monroe provides technical assistance to a Lee County D-SNAP worker. As Southeast Regional Office Interim Regional Administrator, I’m proud to serve alongside staff that have worked tirelessly with federal, state and local partners in response to the devastation. Thanks to these concerted efforts, USDA resources are and will be available throughout the long and difficult road to recovery, as lives begin the journey back to normal. Returning from Leon County, where Florida recently opened its largest Disaster Supplemental Nutrition Assistance Program (D-SNAP) site, I witnessed firsthand how critical D-SNAP benefits are to qualifying families, many of whom don’t normally qualify for SNAP benefits, but desperately need assistance after suffering disaster-related damages. 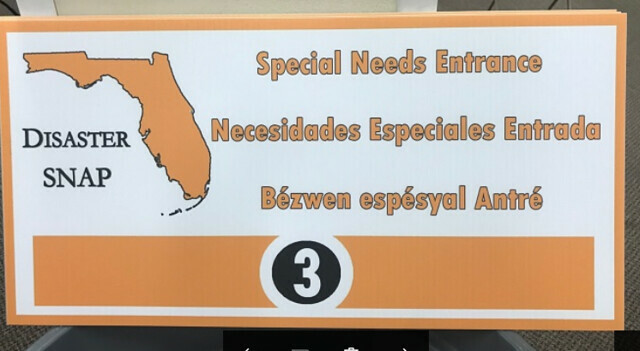 The Florida Department of Children and Families was laser-focused on ensuring all who qualified had access to the program, while safeguarding the program’s integrity. 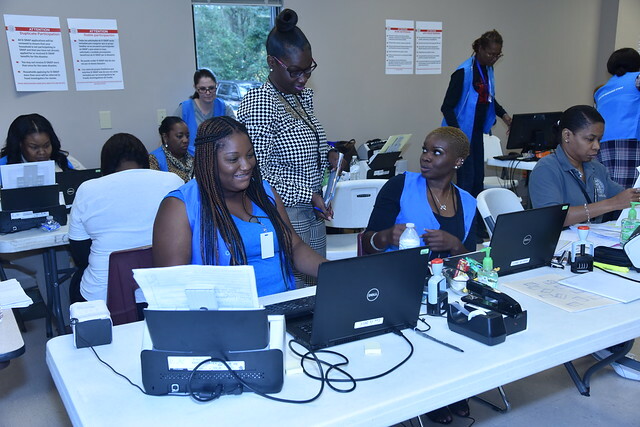 While the timing and conditions of D-SNAP vary with the circumstances of each disaster and each state, the program always begins after access to power and SNAP-authorized food retailers have been restored and families are able to purchase food to prepare at home. Twelve Florida and 20 Georgia counties received Presidential Disaster Declarations for Individual Assistance related to the storm. Each was approved by USDA for D-SNAP and various SNAP waivers such as waivers for the mass replacement of benefits, the temporary approval to purchase hot foods and extending the timely reporting of food loss. While the recovery process will be challenging, it’s comforting to know our partners are there with us every step up the way, helping USDA do right and feed everyone.